In 2017, it's time to sparkle. A celebration more than 25 years in the making is about to unfold at Disney's uniquely European magic kingdom. In 1987, The Walt Disney Company signed the deal that would bring its founder's most famous fairytales to life in the lands that created them. 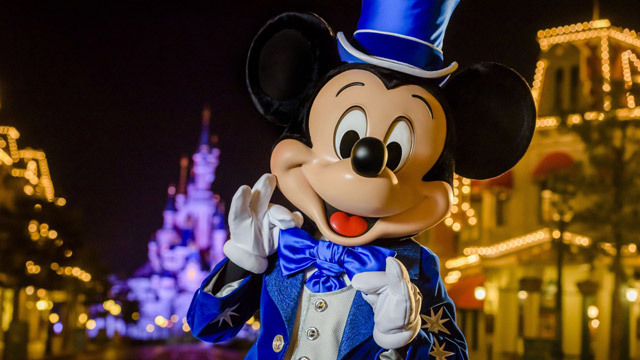 Now, 25 years since its grand opening and over 60 years since Walt Disney first invented the Disneyland concept itself, Disneyland Paris is preparing the celebrate a momentous milestone. It might never have happened. Saddled with enormous debt from the sheer cost of building such a richly detailed theme park and no less than seven hotels from the outset, Disneyland Paris still struggles to make financial headway — but always seems to pull through. Where it excels, though, is in the visitor experience; something that will genuinely be better than ever in 2017. With a newly heavily-vested interest, Disney has made great strides to bring it in-line with its American resort standards. Almost two years of upheaval have seen every inch of the parks revitalised in a major Experience Enhancement Program: looking again at original concepts, embellishing and renewing what works and coming up with something new where fresh ideas are needed. The whole resort both looks and feels better for it, and you will notice it: it genuinely seems to sparkle again. Adding to this is a well-rounded slate of brand new additions, covering all bases. Star Wars continues to be a keen focus, with both Star Tours: The Adventures Continue — an update but really as good as a whole new attraction — and Star Wars Hyperspace Mountain — a whole new Space Mountain experience. If you loved Disney Dreams!, you might be astonished to see this beloved nighttime spectacular replaced by an entirely new show. 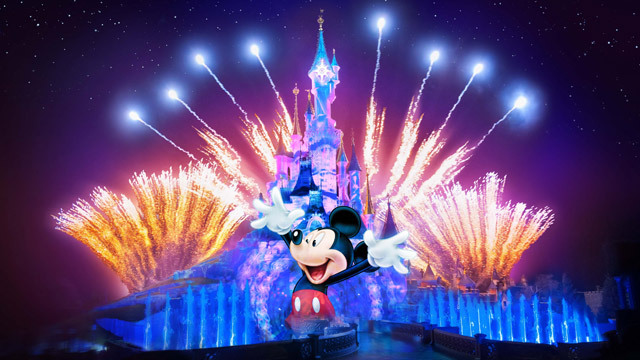 Featuring Mickey Mouse as its host, Disney Illuminations will take the nighttime castle show to brand new places. On the parade route, a fresh cavalcade will see Disney Stars on Parade look to the stars as the first fully new parade since the 15th Anniversary. 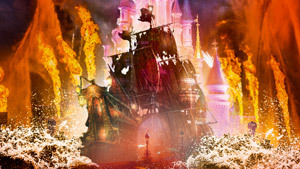 Brand new floats coming to Paris include a spectacular fire-breathing Maleficent dragon. Covering the classic favourites, Mickey Mouse presents "Happy Anniversary Disneyland Paris", a daily happening with numerous popular characters, while the Starlit Princess Waltz presents a picture-perfect royal moment on stage. If you didn't get to experience Disneyland Paris with its grand opening sparkle, this is your chance. And if you've been a lifelong visitor every year since, well — this is the moment you've been waiting 25 years for. With brand new attractions, time-limited entertainments and parks more immersive than ever, this is the best time in years to visit Disneyland Paris. Get up to 2 Nights & 2 Days Free + Free for Kids Under 7 with your 2018 package when you book before 5th February 2018 — there's still time to sparkle. Get ready to sparkle with our collection of original videos and Disneyland Paris teasers for an unforgettable year. Totally new floats, new costumes and a brand new soundtrack revitalise the parade route with the must-see of the year. Disneyland Park's first wholly new parade in ten years, Disney Stars on Parade brings a fresh feel to the park every day with some seriously impressive floats. 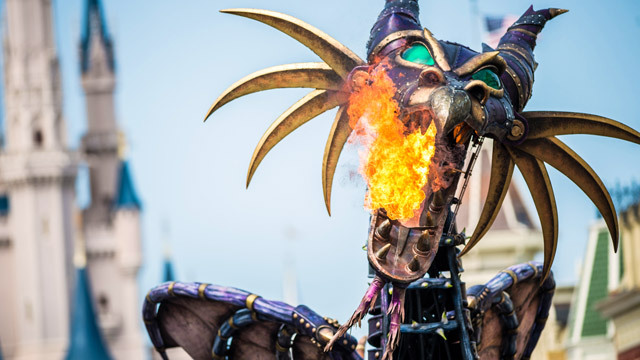 Several feature a futuristic-past Steampunk theme, including the spectacular Maleficent dragon, which even breathes real fire as it rolls down the parade route. A newly-built twin of the same showpiece float in Florida's latest parade, this isn't the only outsourcing: two floats were also taken directly from a previous Tokyo Disneyland parade. Given the quality of the parades Tokyo runs, re-using its floats for a brand new audience is no bad thing. The parade still has its own originality to tie it all together, with two original floats including Frozen and a gorgeous opening float which features a giant telescope looking back along the parade route of stars. Clever, right? Contemporary Disney favourites and blockbusters come to life in a brand new nighttime spectacular each night. What do you do when you have one of the most popular Disney nighttime spectaculars in the world? Replace it! In daring decision, Disney Dreams! will be replaced after just five years with this completely new show. Instead of Peter Pan's shadow getting lost, we'll follow Mickey Mouse as he stumbles through a series of Disney scenes, with a more modern edge led by several live-action movies. Highlighting this, Beauty and the Beast will be featured not via the classic 1991 animation but by its 2017 remake starring Emma Watson, ensuring the show feels right at the leading edge. Big franchises Pirates of the Caribbean and Star Wars will both be included, bringing "a galaxy far, far away" to Paris' Sleeping Beauty Castle for the first time. Inspired by the Mickey Mouse-hosted Ignite the Dream at Shanghai Disneyland, which only premiered in 2016, the show is nevertheless said to have perfectly enough elements unique to Paris, too. Animated favourites won't be forgotten, either — Frozen is already confirmed, of course, and The Little Mermaid. Does the show tug on the heartstrings as much as the perfect Disney Dreams! storyline? Nowhere close, but it's commendable to see Disneyland Paris trying something new and simply letting a classic bow out. Board your Starspeeder 1000 and fly to a whole new galaxy of Star Wars locations. 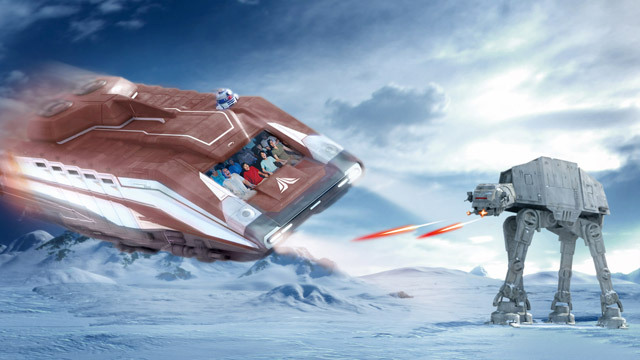 Twenty five years after setting up their Discoveryland astroport, this classic simulator ride has received the impressive "Star Tours 2" upgrade, bringing both cutting-edge technology and massively improved re-rideability. Rather than always heading for the Moon of Endor, destinations are now randomised, which each departure featuring several different scenes from a lengthy playlist — including Jakku and the latest Star Wars: The Force Awakens. With thirteen segments of film (and programmed simulator movements), there are up to 96 different ride combinations. You won't just ride it once! Digital, 3D projection and improved lighting and décor throughout the attraction all create a vastly superior experience. Is it a whole new attraction or just an upgrade? Even if you're familiar with the original, it really feels brand new. Join the Rebel Alliance on a mission against the Galactic Empire in the most thrilling Star Wars ride in the galaxy. Disneyland Paris opened Space Mountain: De la Terre à la Lune in 1995 with the greatest storyline of all its worldwide cousins. This year, the mighty Columbiad Cannon resting on the side of the mountain won't be blasting us into a Jules Verne fantasy but a galaxy far, far away. In truth, that "From the Earth to the Moon" story has been fantasy for many years anyway. When Space Mountain: Mission 2 ripped the heart and soul out of the attraction in 2005, it lost something special. If we're going to have a different theme awkwardly overlaid on this Steampunk icon, at least this one will be popular. Reviews of the seasonal overlay in California are gushing, and if we can't have the ride's rousing original 1995 score back, well, John William's classic Star Wars March is a good second. 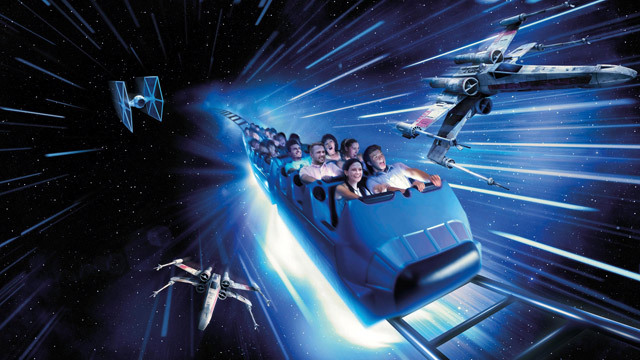 While Star Tours remains relatively family-friendly, this is a full-scale thrill ride with TIE fighters and X-wings thundering past as you twist, turn and loop upside down through a genuinely hair-raising Death Star battle. Brand new, smoother trains are also finally rolling on its roller coaster tracks. So, however your brain hurts having to join up a Star Wars storyline in this Victorian-era building, at least your ears won't be taking the same bruising. Mickey presents "Happy Anniversary Disneyland Paris"
Each daytime, Mickey Mouse enlists the help of classic Disney characters to create an unforgettable anniversary celebration in front of Sleeping Beauty Castle. 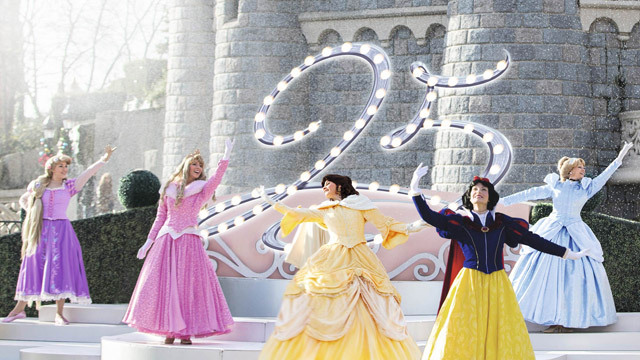 Scheduled to take place on Royal Castle Stage, this unique daily celebration created especially for the 25th Anniversary is a great chance to see many of your favourite Disney characters together at once. A rainbow-coloured throwback to the early musical "revue" shows like C'est Magique, this might just be the sleeper hit of the celebration. From Snow White to Rapunzel, Disney Princesses spanning generations come together in a beautiful, picture-perfect celebration. Based on the popular Royal Christmas Wishes event, this unique spectacle unites an amazing number of Disney Princes and Princesses on stage at the same time, for a "starlit waltz" in front of Sleeping Beauty Castle. 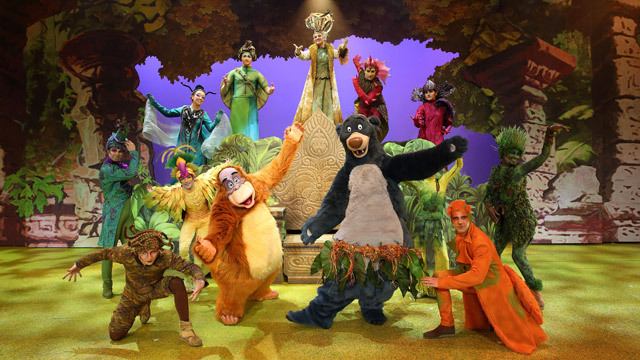 Note that this production is replaced by a new seasonal show during Disney's Enchanted Christmas. Alongside the brand new 25th Anniversary entertainments, more shows and events bring the parks to life. Star Wars: A Galaxy Far, Far Away & First Order March This outdoor stage spectacle at Walt Disney Studios Park recreates classic Star Wars moments with its most famous characters live on stage. The Forest of Enchantment Wild Disney stories come to life in a Broadway-style musical adventure. Featuring The Jungle Book, Pocahontas, Tarzan and Tangled. Disney's Enchanted Christmas Festive shows and parades bring winter cheer across both parks, including Goofy's spectacular new nighttime production at Walt Disney Studios Park. Brand new parade, shows and enhanced attractions. 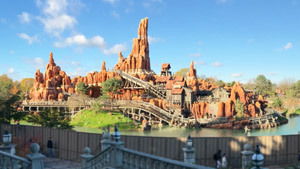 Big Thunder Mountain Huge restoration and enhancement project saw the entire Rivers of the Far West drained, with "explosive" new showpiece scene. Pirates of the Caribbean Major technical upgrade also introduces Jack Sparrow and characters from the blockbuster movies with exclusive new special effects. "it's a small world" The irresistibly catchy round-the-world cruise looks better than ever with new lighting, new dolls and a massively improved, vibrant façade. Peter Pan's Flight Neverland never looked so good. Every scene has been completely repainted in fresh blacklight paint, with new lighting and effects. La Cabane des Robinson The wild heart of Adventureland beats again, its caves and bridges feeling like fresh discoveries; the Treehouse faithfully restored and lived-in, as if the Swiss Family Robinson really retreat there after a long day of island exploration. Remember and relive your first visit. Rediscover those attractions you haven't done for years. However long you're planning to stay, add an extra day. You'll enjoy the revitalised resort so much more at a calmer pace. Bring the whole family — invite your parents, grandparents or best friends to experience what Disneyland Paris means to you. This is the showcase year; it's never looked better. Keep an eye out for special 25th Anniversary merchandise and collectibles throughout the resort — they'll go great with that 5th Anniversary stash at home! Stay at a Disney Hotel. If you're going to upgrade to on-site accommodation in any year, make it this one. Book a Meal Plan to get breakfast included with your hotel and fixed prices on the resort's best quality buffet and table service dining, much of it recently improved. A rolling programme has upgraded Disneyland Paris hotels with renewed décor and hospitality. Disney's Newport Bay Club A stunning transformation has brought a new warmth and vibrancy to this 1900s New England coastal retreat, now boasting a 4-star rating, upgraded restaurants, new Compass Club premium rooms and a new boutique. Highly recommended. Disney's Hotel Cheyenne Book a new 'Texas' room to enjoy a modernised style with fun new Toy Story Sheriff Woody décor that will be rolling out across this affordable hotel by Summer 2017. As an extra bonus, Disney Characters will return to meet guests at Disney Hotels during the 25th Anniversary! From beetroot fields to Sleeping Beauty. 1987 — Agreement signed between French government and The Walt Disney Company to bring a Disney resort to Marne-la-Vallée. 1992 — Euro Disney Resort opens with Euro Disneyland park, seven hotels and Festival Disney entertainment complex. 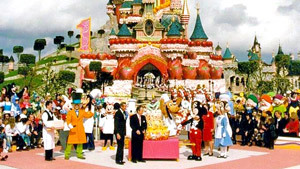 1994 — Rechristened as Disneyland Paris, to give the resort closer ties to its romantic host city. 1995 — Space Mountain: De la Terre à la Lune opens, providing a much-needed financial boost. 1997 — 5th Anniversary celebrated with a Hunchback of Notre Dame "Festival of Fools" carnival. 2002 — Walt Disney Studios Park opens its gates with 10 attractions. 2006 — Buzz Lightyear Laser Blast opens, replacing Le Visionarium. 2007 — 15th Anniversary launched with Disney's Once Upon a Dream Parade. Crush's Coaster and Cars Quatre Roues Rallye open. 2008 — The Twilight Zone Tower of Terror opens. 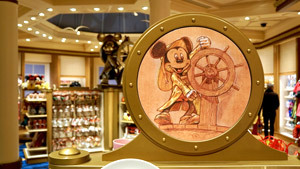 2012 — 20th Anniversary celebrated with Disney Dreams! nighttime spectacular. 2014 — Ratatouille: L'Aventure Totalement Toquée de Rémy opens. Experience the anniversary sparkle while it lasts with this Summer 2018 deal. Park Opening Hours Know your hours, plan your days. Closures & Refurbishments Check which attractions are closed. Disney's Fastpass Save time at the biggest attractions. Meal Plans Dine deliciously with fixed prices.